A moving account of how a soccer team made up of diverse refugees inspired an entire community here in the United States. Based on the adult bestseller, Outcasts United: An American Town, a Refugee Team, and One Woman's Quest to Make a Difference, this young people's edition is a complex and inspirational story about the Fugees, a youth soccer team made up of diverse refugees from around the world, and their formidable female coach, Luma Mufleh. Luma Mufleh, a young Jordanian woman educated in the United States and working as a coach for private youth soccer teams in Atlanta, was out for a drive one day and ended up in Clarkston, Georgia, where she was amazed and delighted to see young boys, black and brown and white, some barefoot, playing soccer on every flat surface they could find. Luma decided to quit her job, move to Clarkston, and start a soccer team that would soon defy the odds. Despite challenges to locate a practice field, minimal funding for uniforms and equipment, and zero fans on the sidelines, the Fugees practiced hard and demonstrated a team spirit that drew admiration from referees and competitors alike. 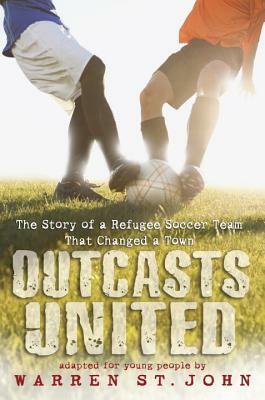 Outcasts United explores how the community changed with the influx of refugees and how the dedication of Lumah Mufleh and the entire Fugees soccer team inspired an entire community. WARREN ST. JOHN is the author of the national bestsellers "Rammer Jammer Yellow Hammer: A Journey into the Heart of Fan Mania" and "Outcasts United: An American Town, a Refugee Team and One Woman's Quest to Make a Difference." A former reporter for the New York Times, he has also written extensively for The New Yorker, the New York Observer, and Wired. He was born in Birmingham, Alabama, attended Columbia University and now lives in New York City.